1. I don't think I will have time to see all the gardens in one day. May I spread the tour of gardens over the two days of the Garden Tour weekend? Yes, you may start your tour on Saturday and finish on Sunday. Please note that the gardens open at 10AM but close promptly at 5PM on Saturday and 4PM on Sunday. 2. Do I need to reserve tickets ahead of time? Groups must reserve tickets ahead of time to get the discount for groups of 10 or more. Individuals do not need to reserve tickets. (See the Group Tours page for more info). 3. How long should I allow for the Garden Tour? Time to see the gardens certainly varies by individual and by the amount of time spent in each garden. Generally, 3-4 hours should be sufficient to see the gardens in town and maybe a little longer for the gardens in the countryside since driving to the gardens will take a little time. You have the whole weekend to see the gardens, if you choose. 4. How much walking is involved in the Town Tour? Most of the gardens on the Tour are private gardens. Many of the Town Tour gardens are located within the Historic District of Hermann which is about one mile square. However, we usually have at least one garden which is on the edge of Hermann and may involve walking up a fairly steep hill. So, a combination of walking and driving usually is best. Some gardens have steep slopes and steps at the entrance. Others have uneven ground. And of course, grass may be slippery from dew or rain. Wearing comfortable shoes is a must. 5. How much walking is involved for the Country Tour? Country Tour gardens are generally much bigger than town gardens and therefore involve more walking. 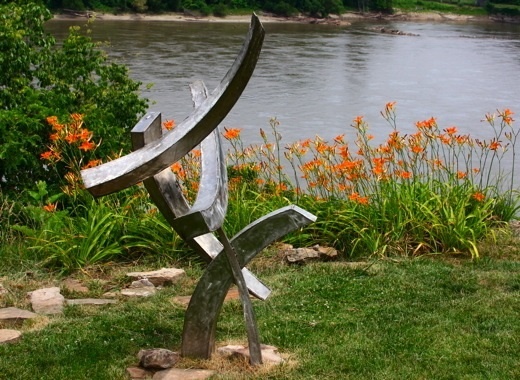 Since Hermann is in the Missouri river hills, a number of these gardens have slopes to walk up and down. 6. Do I do this tour on my own or is there a guide? The tour is self-guided. When you pay the tour fee on tour weekend, you will receive a map showing where the gardens are located. The descriptions of the gardens will be on this website. 7. What if it rains? Do I get a refund on my ticket? No. Gardens and gardeners love a good rain. The Garden Tour goes on rain or shine. 8. May I bring my pet with me while I go on the garden tour? No pets are permitted in the tour gardens. We also recommend that you not bring a pet and leave it in the car.